Josh Jenkins and crew will be performing live at Camp Huawni July 21st for a private concert! Josh Jenkins and crew will be performing at Camp Huawni on July 21st! We are super excited as campers and counselors are looking forward to hearing GRO live. “Green River Ordinance Performing at Camp Huawni ” posted by Travis at 3:54pm, July 11th, 2016. Copyright Camp Huawni. Thank you, Bay Area, for featuring Camp Huawni in your May/June 2015 issue! We are continually thankful for our Camp families who share about their experiences at Huawni. “Huawni Featured in Bay Area Magazine” posted by Travis at 2:45pm, July 18th, 2015. Copyright Camp Huawni. Lantern Camps selected Camp Huawni as one of the best summer camps in Texas in 2015. Camp Huawni was recently selected by lanterncamps.com as one of the best summer camps in Texas. Lantern Camps is a third-party recommender of camps for parents looking into overnight summer camp for their son or daughter. Lantern Camps helps parents filter through the top camps in order to find the best fit for their child. In order to be featured on lanterncamps.com, Camp Huawni had to go through a multi-step interview process. “Camp Huawni picked as one of the best summer camps in Texas” posted by Travis at 10:29am, March 25th, 2015. Copyright Camp Huawni. Ivy has attended Camp for four years now and love seeing her come back every year. Camp Huawni has had the great opportunity to be featured in Portfolio San Antonio Tu Pasaporte a los Negocios, a local news magazine. We have been fortunate and blessed to expand our Camp Huawni families, including in San Antonio. Thank you to the Otero family for your continual support of Camp Huawni over the last couple of years as well as sharing about Camp Huawni. Manuel (attended Camp for three years) and Ivania (attended Camp for four years) have learned life skills that can be applied to their daily lives. “Camp Huawni featured in Portfolio San Antonio Tu Pasaporte a los Negocios” posted by Travis at 4:56pm, July 13th, 2014. Copyright Camp Huawni. 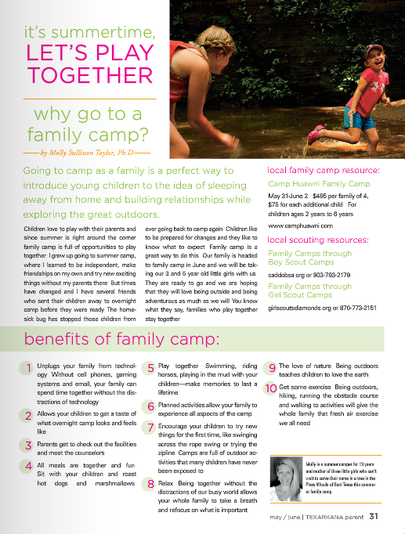 Just ran across a great article by alum Dr. Molly Taylor on reasons to go to Family Camp. Molly – great article! Thank you for sharing with Texarkana families the joy that is Camp Huawni. To read Dr. Taylor’s article, go to page 31 here. “Camp Huawni Family Camp In Texarkana Parent” posted by Travis at 1:39pm, May 15th, 2013. Copyright Camp Huawni. The Gilmer Mirror shared a press release on the launching of our summer camp website. The Gilmer Mirror, Gilmer, Texas’s newspaper since 1877, gave Camp Huawni some neat-o publicity on the launch of our new website. “Camp Huawni in The Gilmer Mirror ” posted by Travis at 12:02am, November 21st, 2012. Copyright Camp Huawni. 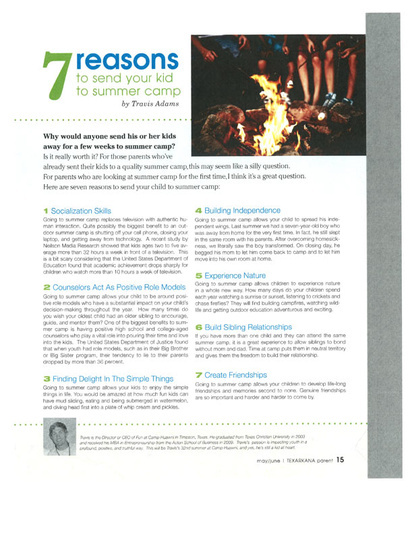 Travis wrote a neat article called “7 Reasons To Send Your Kid To Summer Camp” in the May/June issue of Texarkana Parent. Since Camp Huawni is near Texarkana, it was fun to highlight some of the summer fun benefits to sending kids to an overnight summer camp. We’d like to say a special thank you to Heather Thomson for posting this article. “Camp Huawni in Texarkana Parent Magazine” posted by Travis at 12:43pm, October 14th, 2012. Copyright Camp Huawni.